The National Archives and Records Administration (NARA) has prepared detailed descriptive pamphlets for each state where the Freedmen’s Bureau operated. The descriptive pamphlets are in-depth guides to the records contained on each microfilm. To get the most from your research in Freedmen’s Bureau records, you should read the descriptive pamphlet for your state of interest. Doing so can lead you to hidden treasures you might otherwise overlook. What’s In a Descriptive Pamphlet? The first portion of a descriptive pamphlet details the history of Freedmen’s Bureau operations in a particular state. Here you can learn about the duties of the bureau and how these duties were divided among the various departments within the bureau. Knowing which branches of the bureau generated records, and for what purpose, can not only help you identify records of interest within the collection, but can also help you identify related record sets and next steps if you find a record of interest. 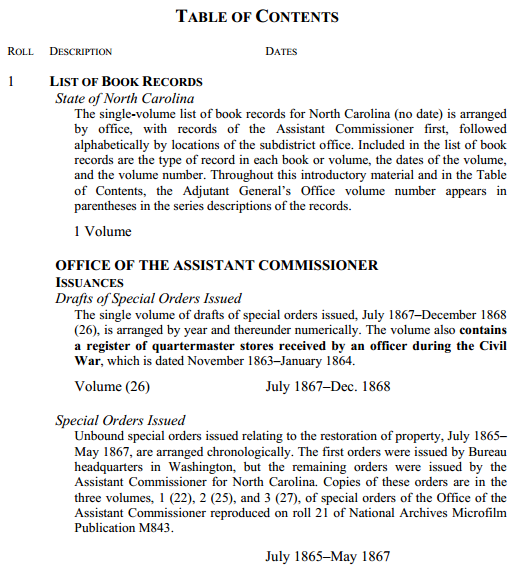 Here you learn about other records for North Carolina that you can order from the National Archives. Reading this section carefully can lead you to research “next steps” that can keep your research moving forward, and add to the story of your ancestors’ experiences. We hope that this brief introduction has given you a good idea of what you will find in a descriptive pamphlet. To access the descriptive pamphlets for your states of interest, please click on each state in the left sidebar of the Research Guides page. You will need the free Adobe Acrobat Reader software to view the descriptive pamphlets. You can download Adobe Acrobat Reader here. My ancestors were slaves in Yanceyville, Caswell County, NC, and in Winston, NC. How do I zero in on those areas for letters and actions that might’ve affected my Bethel Williamson Family and John Gorrells? Thank you for visiting the site! You can go to the Field Offices map, then zoom in until you see Yanceyville. It looks like Graham, Hillsborough and Greensboro are the closest offices to Yanceyville. You can click on those map icons, then follow the links to where the microfilms are online, and start reading. The films are not yet indexed on FamilySearch so you will need to read the films to see which field office was responsible for keeping records for Yanceyville. When you find which, then you can read each microfilm for that field office. My great grandparents, Walter and Rachel Messer Marriage, taught in Friedman’s schools between 1870 and 1875 under the auspices of Philadelphia Yearly Meeting (Society of Friends or Quakers). They taught in two places: Clover Depot, Virginia and Lincolnton, NC. 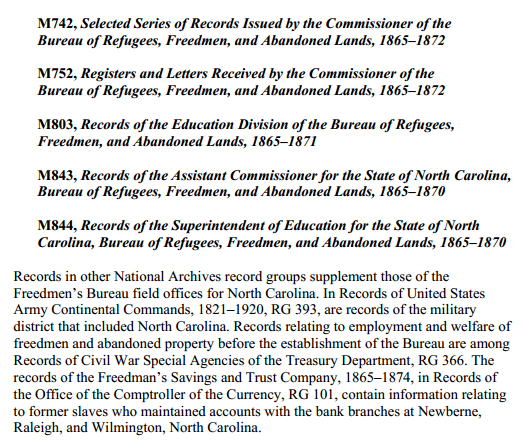 These schools were not operated under the auspices of the US Government-sponsored Freedman’s Bureau. The time frame is a little later than what I see browsing this site. Is it likely any information would be found in the maps? Note: I tried clicking on maps where I thought these two states might be located but there was no response. Can someone help? Hi Eleanor, we had our map images linked the wrong way, we fixed it a few minutes ago. Please do let us know if you encounter any further difficulty. Thank you so much for writing to share your grandparents’ experience as teachers!